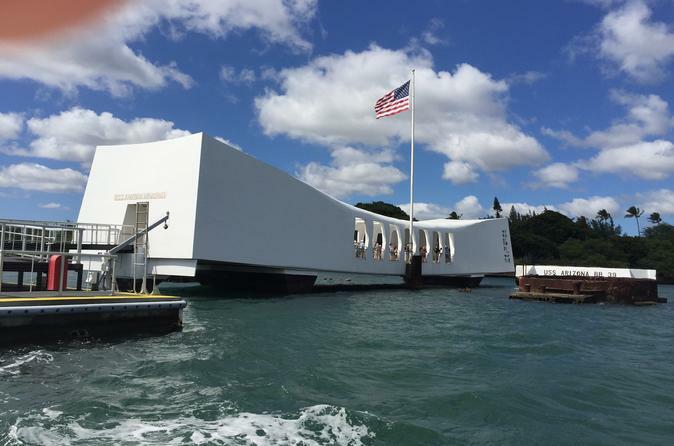 Let a professional driver chauffeur you directly to Pearl Harbor — one of Hawaii’s most visited attractions — and get skip-the-line admission to the USS ‘Arizona’ Memorial (or a boat tour around the memorial while it's closed for repairs). There’s no need to hire a taxi or take the bus; instead, relax with round-trip transport from your Waikiki hotel, Kahala Resort, the Honolulu airport, or the cruise port. Start your tour with pickup at the Kahala Resort, Waikiki hotels, the Honolulu cruise port, or the airport. You’re chauffeured to Pearl Harbor where you are offered juice or chilled bottled water and accompanied to the Pearl Harbor Visitor Center. Here, you are met by a tour representative who provides a brief orientation along with your reserved ticket to the USS Arizona Memorial. Once you're transferred by boat to Pearl Harbor’s most visited monument, there's no need to wait in line. Simply use your priority admission to explore this top Hawaii destination at your own pace. Visit the Road to War museums before your 4-hour tour concludes with return transport back to your original departure point. Please note: While the USS Arizona Memorial is closed for repairs, instead of a skip-the-line admission ticket, you'll enjoy a boat tour around the memorial instead.